Yesterday, I met a mega celeb at work. The Target mascot! You know, Bullseye, the Bull Terrier? He was the ultimate professional. So dapper and ready to dole out his love to a bunch of PR ladies. When the world feels like it is literally crumbling around you, an office visit from a celebri-dog (like does he know how famous he is?) is a much needed break from reality. On an unrelated but related note (because, Target), I’ve got some news. Scroll to the end, too, because I’m serving up my first giveaway of 2017. Have you scanned the beauty aisles at Target lately? I’m into it all. So much newness on the shelves. Among them, a whole lot of brand new and first from ChapStick. They gave me a preview of the new exclusive to Target Total Hydration line that is cropping up on shelves and there is a lot to unpack. And, because it’s ChapStick, nothing is more than $5. 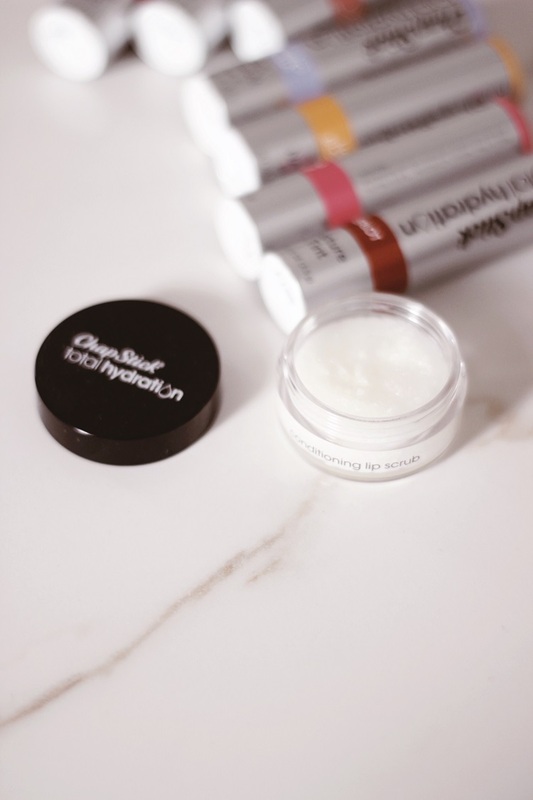 At the end of this post, I’ve got a giveaway for a $25 Target gift card and the ChapStick Total Hydration line – make sure to enter! Sorry that I can’t hook you up with a Bullseye visit to accompany it – that was a totally separate and unrelated work perk. I’ve used ChapStick forever and will always save a spot in my bag for the Classic Strawberry (all time fav flavor). 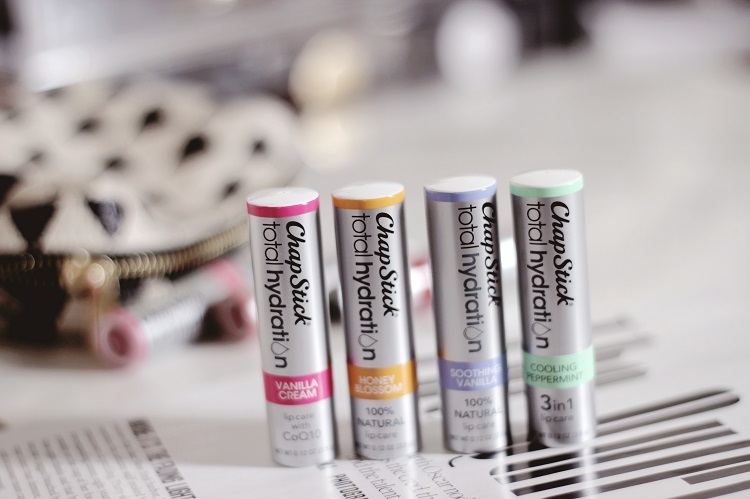 Now ChapStick has tints – a first for them! – in twist-up tubes that are reminiscent of another high end brand I’m fond of and I’m guessing you are, too. 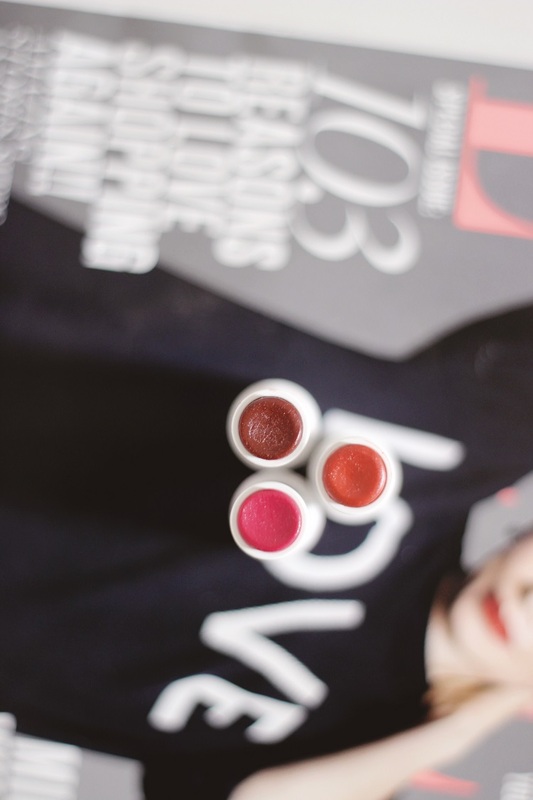 I tried Rose Petal, Coral Blush and Merlot and was impressed with how saturating and comfortable they are to wear. Merlot is more brown than it is berry, Rose is actually quite pink and Coral Blush is peachy neutral perfection. It’s a more premium version of the ChapStick you probably grew up using. I’m wearing the Coral Blush here. There’s also a Conditioning Lip Scrub that is a nice budget alternative to others out there. I’ve never quite mastered making my own so this is a lovely alternative for under $5. I’ve been careful not to ingest any of the sugar (was very serious about my Whole 30 compliance in January). It has coconut oil, vitamin E and Shea Butter – it’s a creamy blend and not crumbly in the least. I do this a few mornings a week when my coffee is brewing and then I saturate my lips with a tube of Honey Blossom. Definitely the sweetest combo I’ve had on Whole 30. I usually get up an hour or so before I start getting ready and with all the heat I’ve got cranking, my lips are ready for moisture when I wake up. I like how this one feels – it’s really moisturizing. 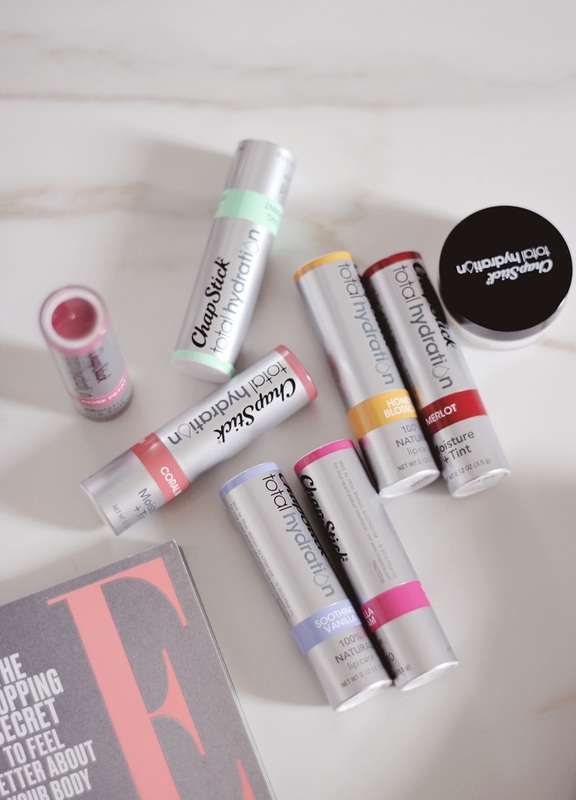 There’s also a 3in1 K-beauty inspired ChapStick that is uber refreshing. This is the one I usually toss in my coat pocket. There’s something really refreshing about Cooling Peppermint on the lips when it’s cold outside. Dare I say it’s almost like chewing gum? I really did stay true to every facet of Whole 30 and even gave up gum. I brush twice a day and floss after lunch but I can’t completely wear my enamel down for the sake of a better relationship with food. Note: this post was sponsored by Pfizer Consumer Healthcare – opinions and thoughts are mine! Thanks to ChapStick for the continued partnership. 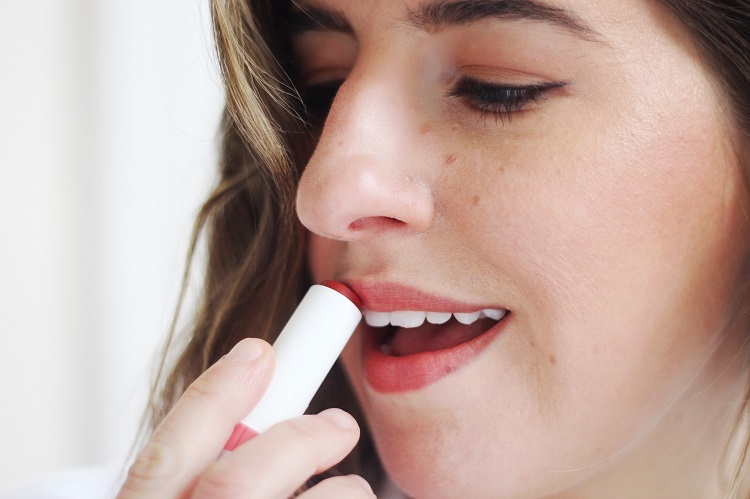 Now this is exciting – I’m an avid Chapstick wearer/user and the subtle colors look great for day! Looking forward to trying these out. Good luck in your last few days of Whole 30! Love the new Chapsticks! Would like to try them all. I haven’t used Chapstick for some time, but I’m excited to try this new line! Thanks for entering, Angela! I think you’ll dig these. I wore the original chapstick for years and years, just recently switched over to the flavored and like them a lot!! Susan, thanks for entering! The original has such an iconic smell. It’s very comforting to me. Yes I still wear and love ChapStick. Thanks for entering – you will really like these! If I say no, can I still win? 😉 I’m intrigued by these! I wear Chapstick every day of the year, and put it on several times a day! I love it! Especially like trying different flavors! I haven’t worn ChapStick in years, but I love that coral blush! I plan to check it out next time I’m at Target. I most certainly do still wear chapstick. 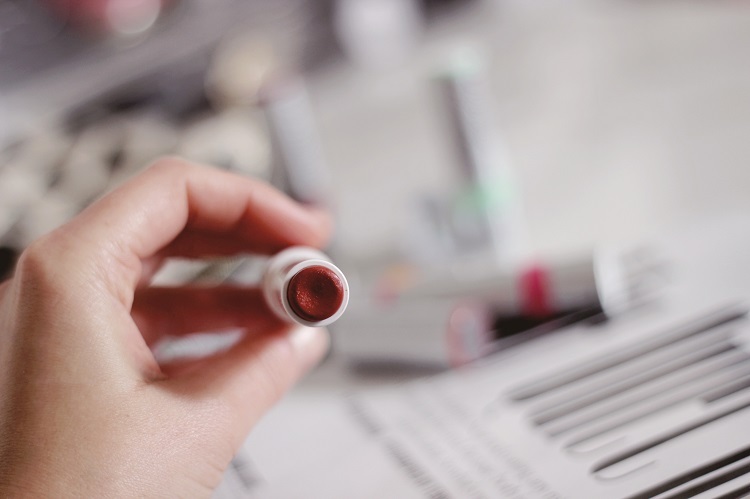 It is always my go to lip care product. I wear ChapStick brand, but I am usually buying the original. I love it! My 2 daughters and I use the cherry ones and this winter we have used a lot! Yes i do, i wear it daily! I have not used chapstick since high school. Throwback! Thanks for entering, Lisa. I’ve always got a Chapstick in my purse and another at my desk at work! Definitely an everyday essential, especially during the winter. 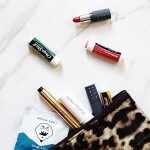 Jenna, I stash lip products everywhere – that sounds familiar! Thanks for entering. Honestly, I haven’t used Chapstick in years. 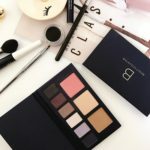 But I had not idea how many different product lines they had – I’m pretty impressed! I think it’s about time I started using Chapstick again! Yes, I do wear Chapstick. I really like the tinted kinds. Thanks for entering, Kelly. The tints are really nice! I stopped using Chapstick. But I’m excited to try the NEW Chapstick! I do not use Chapstick. Oh we do so much! I have always loved the classic cherry Chapstick! Our little one really loves it to and its so gentle on his chapped lips! I cannot wait to try the new 100 percent natural! Yes! Cherry chapstick is my favorite! 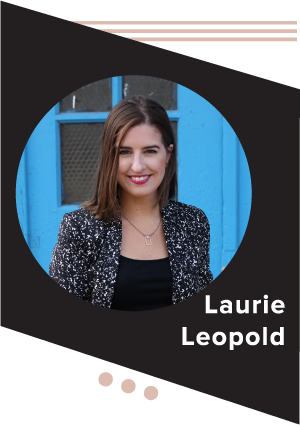 Laura, thanks for entering. I always have that Katy Perry stuck in my head whenever I think of Cherry chapstick. Without fail! I love Chapstick – especially all the new varieties they have come up with. Still love the classics too. Kim, thanks for entering. Classics never go out of style! Thanks for entering, Kim. Classics are always in style! These sound really cool. I like that they are a sheer lipstick kinda like Glossier’s lipstick but with the hydration of a balm. Yes, I still wear and love Chapstick! I do, but not as much as I should. I run every morning and I want to get out there as quickly as I can (so I can finish as quickly as I can) and sometimes (a lot) I forget to put something on my lips and this cold weather is a killer on the lips! I ALWAYS HAVE – EVERY SINGLE DAY. I am addicted to it!!! Chapstick. Is awesome! I only wear Chapstick,I can’t wear regular lipsticks and love the different types that Chapstick has to offer!! Yes, my whole family wears chapstick, especially when our lips begin to chap! YES! I have a slight obsession with Chapstick. Ever since I was a little girl, I have loved trying the newest scent/taste. New hydration chapsticks, and healing chapsticks etc. Now that I am an adult after doing my makeup my chapstick is my finishing touch. I love my lips to feel moist/hydrated rather than dry. I wear chapstick every day! Can’t live without it, especially in the winter time! I do wear chapstick, every day! I actually just bought two sticks of it in the checkout line yesterday. My son’s lips were getting chapped from being outside in the cold Michigan weather.. I gave him the chapstick and they are much better now! Thanks for the chance.